This garage interior shows a cracked and patched slab. Fortunately, of all the floors in or around your house where level matters the least, the garage has got to be number one. The classic test for how much you can tolerate interior floors that are out of level is whether an egg will roll off of the kitchen countertop. This hardly applies to the rough and tumble atmosphere of the garage. As long as you can get the car in and it stays in place, you're golden. Even level-critical services such as the water heater and washer/dryer can be leveled individually. However, an out of kilter garage floor may require leveling when two critical scenarios happen. First, the floor may be so out of level that the garage door does not meet the bottom edge of the door. Second and far more critical is when the garage floor has begun to tilt backward, toward the house. Water from the driveway, often boosted by overflowing gutters and downspouts, begins to flow toward the house itself. Leveling compound is the classic and the easiest to fix a floor that is uneven. In fact, for some interior floors, it's just a matter of pouring leveling compound out and letting it find its own level. 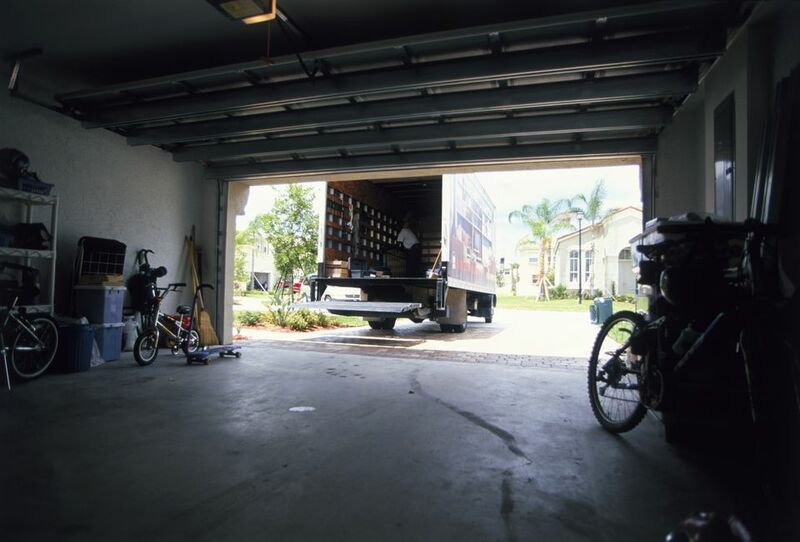 For garages, it is a little less simple. Some home improvement guides advocate for troweling on a concrete patch compound across the entire area of a floor that slopes down toward the doors. While technically a good idea and perhaps a viable one for professional masons, it can be difficult for novices to achieve such results like a couple inches of gain over 20 feet. Instead, apply leveling compound as a spot-fix if you might have a section that has cracked off and is now sloping down. Dips and sags are also great candidates for concrete leveling compound, as they are fairly localized. All areas that will receive the leveling compound must be thoroughly clean for this cement product to adhere properly. Since motor oil can be difficult and even impossible to clean from concrete, abrading the concrete may be necessary. Slab jacking is one method that can correct the tilt of an entire concrete slab floor. You cannot do this yourself and it is expensive. But it is still cheaper than demolishing and re-building your garage. It utilizes your existing concrete slab, with only minor touch-ups required if the slab jacking efforts succeed. It takes about one day for the slurry to cure to its eventual strength of about 2,400 psi (however, this can be regulated by the technicians by adding different proportions of lime or sand). Slab jacking with slurry will be far less expensive than polyurethane-based jacking, due to the lower cost of the source product and because it is a well-established method with many companies offering the service. Foam injections are similar to the slurry injections but are considered more effective because technicians can better predict the expansion of the polyurethane foam. The slurry injections require larger injection holes, plus more project needs to be injected under the slab. By contrast, foam slab jacking requires holes that are slightly over 1/2-inch in diameter. After the hose is inserted in the hole, the foam is injected and a calculated amount of time passes while the foam expands to its maximum size. After the injections are made, the holes are covered over with patching cement. The foam product is far lighter than mud, too. About 2 pounds of polyurethane ​is equal to 100 pounds of slurry. One reason for having a lighter base product would be to avoid overburdening the soil with yet more weight. Because of this, it is often used in weight-sensitive areas such as near bridges. Poly-based slab jacking will cost about four times more than slurry-based jacking, mainly due to the cost of the source product. What Is the Best Siding for Your House? What Are Some Tricks to Save Money at Lowe's?